Sumo is Japan’s traditional national sport and is one of the most popular spectator sports in the country. Sumo has its roots in ancient Shinto religious rites to ensure good harvests. It is believed to be at least 1500 years old. For me it is the traditional aspects and rituals of this ancient sport that really appeal. I will briefly explain about some of the more common traditions and rituals in this post. Sumo wrestlers are known as rikishi and compete in a 4.55 diameter ring called a dohyou (土俵). The ring is made of rice straw bales topped by a platform made with clay mixed with sand. A new dohyou is built for each tournament. Even today, special offerings of Japanese rice are buried in the center of the dohyou to appease the gods. The rules to sumo are quite simple but it’s the rituals surrounding the sport that most find complicated. In many ways the rituals are just as important as the match itself. The rules are the wrestler tries to either push his opponent out of the ring, or unbalance him so that some part of his body other than the soles of his feet touch the ground. Rikishi make distance attacks by using open handed blows, slaps, leg sweeps as well as wrestling with a grip on each other’s belts. A key concept in sumo is kokyu or coordination of breath and movement. The sumo match begins when both rikishi believe they have synchronized their breathing. The concept of kokyu is considered to be uniquely Japanese. Professional sumo is run by the Japan Sumo Association and there are no weight classes in sumo. Sumo wrestlers start young and at the age of around 15 years old traditionally join one of the training stables heya of wrestlers. The stables are usually run by retired wrestlers oyakata and the young wrestlers work their way up through the ranks. The wrestlers are required to live in a communal setting where all aspects of their daily lives are dictated by strict tradition. Modern sumo started back in 1757 as a functioning sport with ranks and record-keeping in place. The sumo rankings are based on a strict hierarchy that dates back to the Edo period. The wrestlers are promoted or demoted according to their performance through-out the six official tournaments held during the year. 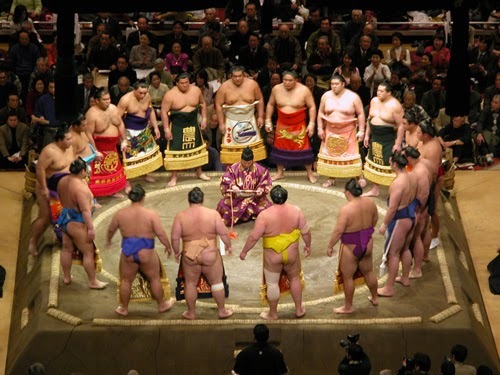 There are six divisions in sumo with the top division makuuchi receiving the most attention. The majority of wrestlers are maegashira and are numbered from one (top) down to about sixteen or seventeen. In each rank there are two wrestlers with the east designated a higher rank over the west. For Example, #1 east, #1 west, #2 east, #2 west, etc. Above maegashira are three champion or titleholder ranks komusubi, sekiwake, and ozeki. These are not numbered and are in ascending order. At the top is the pinnacle of yokozuna or Grand Champion. It is very difficult to become a yokozuna and the criteria is very strict. An ozeki must win consecutive tournaments or have many strong performances to even be considered for promotion to yokozuna. It is possible for more than one wrestler to hold the rank of yokozuna at the same time. Sumo today still retains traces of its Shinto past with many ancient traditions still followed. This includes the shrine like roof that hangs over the ring and the gyoji (referee) who still wears a dagger. It is said that the dagger was to allow him to commit ritual suicide seppuku if he made a bad referring decision. Some of the pre-game rituals include the wrestlers throwing salt into the dohyou to purify the ring, and stomping his legs and clapping his hands to drive away evil spirits from the dohyou. Sumo wrestlers are huge in size and achieve this bulk by eating large quantities of a fattening stew called chanko-nabe. There are six grand sumo tournaments annually in Japan with each lasting 15 days. The tournaments are held in January, May and September in Tokyo, in March in Osaka, in July in Nagoya and in November in Fukuoka. Each tournament starts on the Sunday closest to the 10th of the month. The top ranking wrestlers appear in the late afternoon, so this is usually the most crowded time. If you want to beat the crowds arrive early and watch the lower ranking wrestlers in the morning. Tickets range in price depending on the position. Front row seats can cost around 14,000 yen (USD$140) while second floor tickets range from 2,000 – 4,000 yen (USD$20-40). If you are in Japan when there are no tournaments on, but still want to see a sumo bout, visit one of the sumo stables to watch training. Morning practice starts at around 7 am and the best time to watch it is usually 2 weeks before the start of a tournament. The season has already started with the first tournament of 2014 the hatsu basho in Tokyo. The big interest this year will be whether yokozuna Hakuho can break the all-time record of tournament victories. He currently stands at 27 victories with the record at 32 set by Taiho. Japanese interest will once again be on ozeki Kisenosato, who had a great year last year and is close to becoming the first Japanese yokozuna in many years. A tournament victory here in the current hastu basho would probably be more than enough to secure him promotion to the highest rank. * That's MY definition of walking distance. 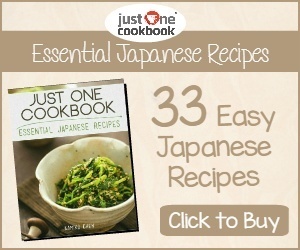 Most Tokyoites would disagree. Grin. Hi Ru, Long time no see! Hope you are well and the busy period will be over for you soon. Definitely should spend a day at the sumo. I plan to attend the summer Nagoya basho this year.